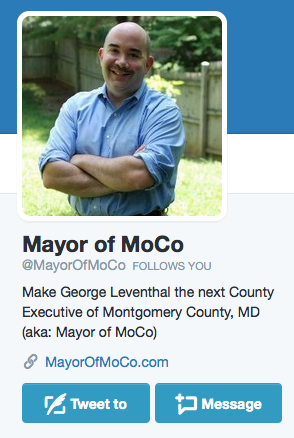 Who is Behind “Mayor of MoCo” Website? 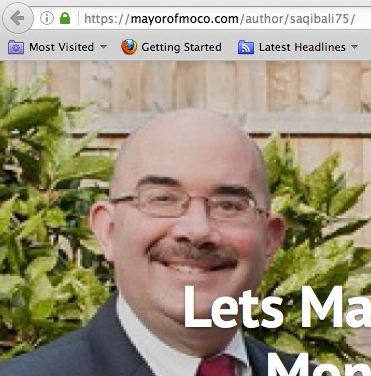 Not too long ago, a web page popped up touting County Councilmember George Leventhal (D-At Large) as the next “Mayor” (i.e. County Executive) of Montgomery County. George is widely known to be interested in the race – he ran last time but withdrew before the primary to run for reelection. Saqib Ali has been very active in MoCo politics. He won election to the House of Delegates on a slate from District 39 in 2006. When the Senate seat became vacant, he sought it but the Montgomery County Democratic Central Committee selected the much more experienced Del. Nancy King for the vacancy. Del. Ali spent most of the next four years of his term in the House openly preparing to challenge King for the Senate seat. Indeed, the 2010 Senate primary was exceedingly close but King prevailed over Sleepy Saqib – as Sen. King labelled him during the campaign – by a margin of 3.4%. In 2012, Saqib made a much less successful run for a Board of Education seat. In 2014, he announced but then pulled back for a run for a seat in the House of Delegates. Since then, he has become known for his activism in support of the BDS Movement, which advocates for boycotts, divestment and sanctions of Israel. At the Montgomery Priorities Hearing, Saqib testified against legislation advocated by Del. Ben Kramer that would have resulted in the State boycotting companies and institutions that boycott Israel. More recently, he testified as a member of the Steering Committee of Marylanders for BDS on legislation before George’s committee on the Council on County legislation. During his testimony, Saqib stated that Israeli settlements are “quite close to a war crime.” He then drops the qualifier when he says that “settlements meet the Geneva Convention definition for ‘war crime.” In short, he is now a strong and public advocate for BDS. Saqib is a longtime friend. He let me know that he was planning to express his enthusiasm online about my potential candidacy for County Executive, but the “Mayor of MoCo” initiative is his alone, and I have had no involvement in it. If I decide to run for County Executive, I will welcome Saqib’s involvement and will hope to win the support of a wide range of county residents, but I am a long way from making any decisions regarding 2018. In my four successful election campaigns, I am honored to have had the support of many activists in both the Jewish and Muslim communities, as well as many other communities. As an at-large councilmember who has represented more than one million constituents for nearly 14 years, I would not expect to agree with every opinion of every one of my supporters. George’s point about not agreeing with everyone of his supporters is a good one. Who does? However, Saqib is not some random supporter among many. Saqib and George may well have become closer allies over George’s support for efforts to incorporate a Muslim holiday into the school calendar – a positive effort that is about recognition and inclusion. But George’s “longtime friend” is also leading local activist in support of BDS who is a former state legislator and has testified at least twice on the issue. At the very least, George raised no objection to this page, which represents his first public move for a bid for County Executive. As a result, pro-BDS Saqib seems more than some minor supporter. I do not associate myself with efforts to boycott Israel or divest from it or impose sanctions on it. I feel a deep affinity for Israel, which I have visited three times. My sister lived there for several years. I support a two-state solution. In general, I would describe my views on the Israel/Palestine issue as consistent with those of J Street. I would not characterize Israeli settlements in the West Bank as a war crime, although I think they are extremely counterproductive to the goal of peace in the Middle East. While many might disagree with George’s views on BDS or Israeli settlements as either too liberal or too conservative, I’d say they fall right in the mainstream of Jewish and American opinion. Some might argue that Donna Edwards’s identification with liberal J Street did her some harm in the Democratic primary, and that the same fate could befall George. More hardline pro-Israel voters do indeed reject J Street. Many others, however, would find George’s viewpoints utterly reasonable. The more serious political problem is when a candidate is perceived fundamentally unsympathetic to Israel. In George’s comments, that is clearly not the case, as he strikes a smart balance of “deep affinity for Israel” and support for a “two-state solution.” But linkage with a prominent BDS supporter in what is essentially his prospective campaign’s first outing undermines that perception. Moreover, Saqib is working to make this linkage stronger. He has now become the first person to attack me on Twitter before I even drafted a piece. Expressing anger at my “smears” and “appalling tactics,” Saqib then turned to faux outrage that I won’t open up this space to him. I look forward to all the pro-BDS webpages opening up their space to AIPAC and J Street. 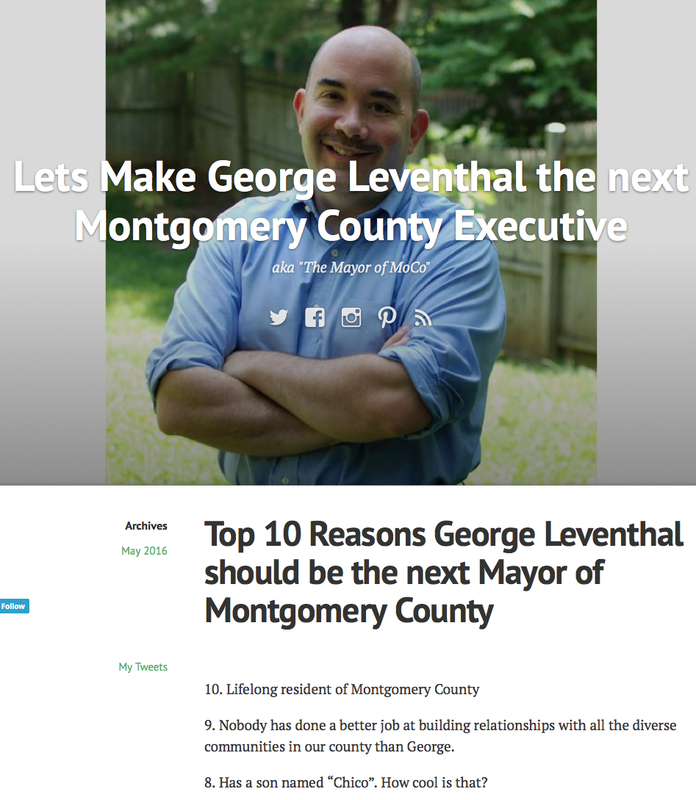 All of this is helpful to getting Saqib Ali more attention but it sure doesn’t help George Leventhal. Foreign Policy in County Elections? Normally, I would not think foreign policy terribly relevant to a campaign for county executive. Aside from the nice Sister Cities program, my hope would be that any county executive focus on the nuts and bolts of making the County work well. But Saqib’s repeated public interventions show how views on the Israeli-Palestinian conflict can become intertwined with even local politics. The injection of a prominent BDS supporter as part of George’s effort to stick his political toe publicly in the water will likely raise concerns among the many voters who oppose BDS and does not help us keep focused on the issues that matter – the ones on which George Leventhal has spent the vast majority of his career and has exhibited a great deal of genuine passion for over the years. Del. Barve would start out as the clear favorite and would be able to tap into significant sources of funding that might not be available to other candidates: Annapolis economic donors, K Street Economic donors and National Indian American donors. He also represents a larger portion of the District than Sen. Manno or Del. Frick. I believe Del. Barve could raise upwards of $1,500,000-$2,500,000 for this campaign. Sen. Manno might be able to consolidate the progressive community in general and the labor movement specifically around his candidacy. He has the potential to raise $400,000-$800,000 for this campaign. Del. Frick is a highly talented politician and would make a dynamic, attractive (in both senses) congressional candidate. His challenge in his aborted AG Campaign was fundraising. The word on the streets of Annapolis and DC has always been that he lacks the intestinal fortitude for call time. However, Del. Frick also has an amazing network spanning from B-CC High School to Northwestern University to Harvard Law to a decade at Akin Gump. He could raise substantial sums by tapping into hat network and carve out a constituency by going on Broadcast TV. Del. Frick could raise up to $1,500,000–if he puts in the work. I’ve also heard rumors that current District 39 Del. Kirill Reznik and former (2006-2010) District 39 Del. Saqib Ali might be interest in throwing their hats in the ring. I think Mr. Ali (who has raised up to a quarter million dollars for his bids for state and local office) would be capable of raising money nationally from the Muslim community. Mr Reznik has an appealing immigrant story that could play well in a Democratic Primary. 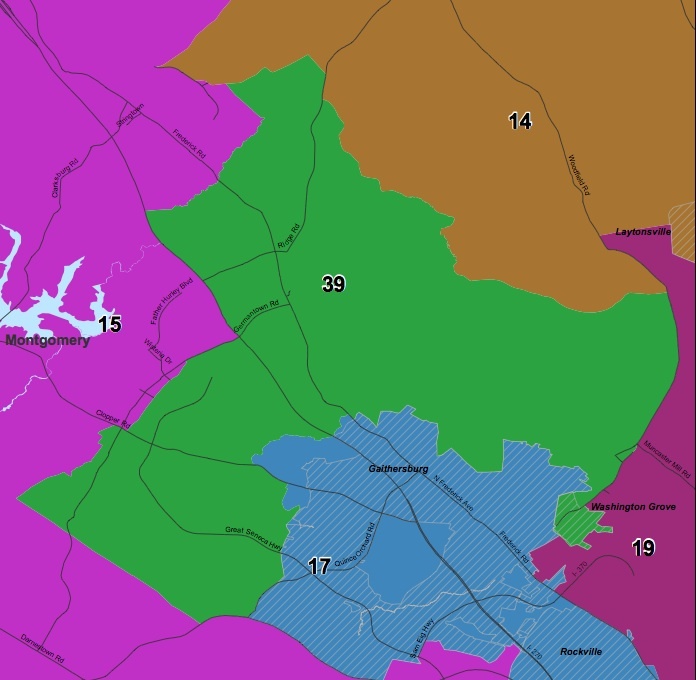 None of the four incumbent Democrats that represent District 39 in the General Assembly face opposition–a surprising change from four years ago and not what many expected. Sen. Nancy King faced fierce competition from Del. Saqib Ali in 2010. Not too long after the 2006 election, Sen. P.J. Hogan stepped down and the MCDCC chose then Del. King, who had won two terms and also served on the Board of Education, for the seat over newly elected Del. Ali. Ali dogged King relentlessly for the rest of the term, continually attacking her as insufficiently progressive. The 2010 primary was rough with Sleepy Saqib pictures that Ali had posted on his Facebook page appearing in King’s mailers. (Kids, there is a life lesson here.) Ali ran a very strong campaign but The Rumble in Germantown ended with King taking the nomination by 248 votes. But not so surprising. Senate President Mike Miller has zero desire to see Saqib in the Senate. And Ali’s aggressive style in the General Assembly did not win him friends among his colleagues, though it was nearly enough to propel him into the Senate. Ali could have established residency in the new D39 but committed to D15 when he sought the delegate vacancy last year caused by Del. Brian Feldman’s appointment to the Senate. Ali entered the delegate election in D15 but pulled out in December. King and Del. Charles Barkley have especially robust campaign accounts–Barkley has 92K compared to 91K for King. Del. Kirill Reznik has a healthy 43K with 26K in Del. Shane Robinson’s account. I guess Reznik needs to serve more expensive hamburgers at his annual Grill with Kirill event. Or maybe Del. Barkley can take him to school. An enjoyable election season for the incumbents in District 39–but not for those watching elections.